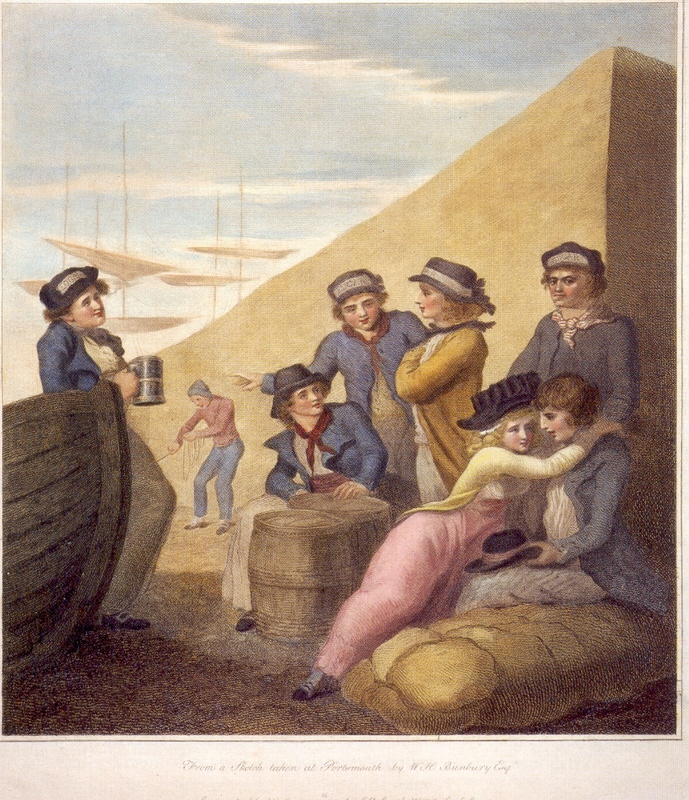 From a Sketch taken at Portsmouth by W. H. Bunbury Esqr., William Henry Bunbury, 1785, British Museum. A second copy from the same collection here. From a Sketch taken at Portsmouth by W. H. Bunbury Esqr., William Henry Bunbury, 1785, collection unknown. It never fails. Every time I think I can say something definitive about what sailors did and did not wear, something new comes along. These men are from the third rate 74 gun Edgar. Launched in 1779, she served at the Battle of Cape St. Vincent the next year. With the end of the American Revolutionary War in 1783, she was relegated to guard duty at Portsmouth, according to Brian Lavery's . book "The Ship of the Line, Vol. 1: The Development of the Battlefleet 1650-1850." That certainly explains why all these bored tars are lounging about ashore with a lady of questionable character. What is most surprising about this print is the hats that some of the tars wear. Never before have I seen evidence of sailors wearing the name of their vessel on their headgear. Most of these mariners wear the name of their vessel on a lighter field. Perhaps this is a card sewn into the front of the two barge caps and on the crown of the round hat. Or maybe it is a painted lighter field with the name then entered onto it. The name might even be embroidered. Most interesting is the fellow with the round hat and ribbon. Until this image, I thought that putting a ship's name on a ribbon around the crown was a purely nineteenth century affectation. I do urge caution in using this image. It is the first and so far the only in nearly 400 primary source images I have examined that actually shows sailors wearing the name of their ship, and is probably not representative of a much wider trend. Nonetheless, it is a fascinating proof that there are exceptions to many assumptions I hold on sailor's slop clothes. Leaning against the boat, a happy tarpawlin holds a large tankard. He wears a round hat with oddly upturned brim and his hair in a bob wig style (if not a wig itself). He wears a jacket with upper lapels flopped back, a black neckcloth, and a white single breasted waistcoat with cloth covered buttons. He plain trousers run down to his ankles, where they hang just above his rounded toe shoe with rectangular buckle. 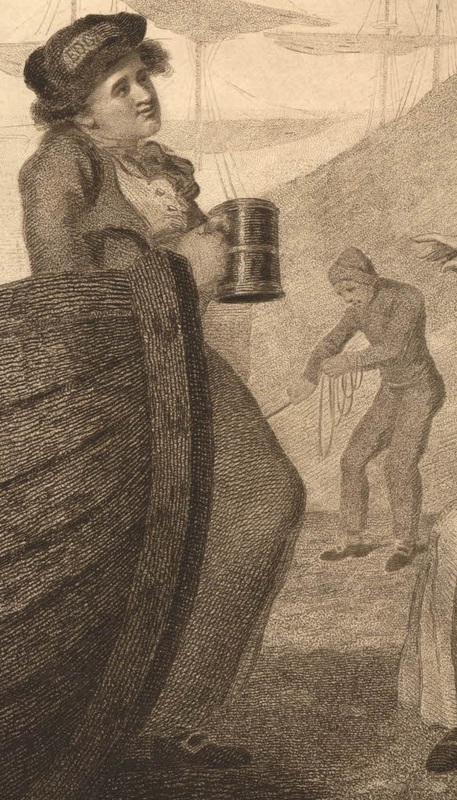 Behind him and hauling on a line (perhaps dragging a boat ashore) is a sailor with a cloth workcap, jacket tucked into the waistband of his plain trousers, and shoes matching those of the mariner in the foreground. These three men gathered around a pair of casks look like they are up to no good. Seated is a tar in a short brimmed high crowned round hat with a black neckcloth and short, curly hair. He wears a short jacket with cloth covered buttons sealing his mariner's cuffs. Around his waist, interestingly enough, is a sash. This is the first that I've seen an English sailor wearing one, as they are far more common among French tars. Standing around him are two of his mates, both with short loose hair tucked beneath their cap and hat, both wear plain trousers and single breasted waistcoats. 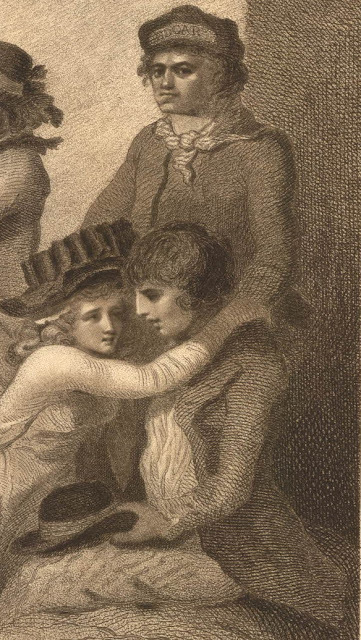 The tarpawlin on the right appears to be wearing something closer to a frock coat with turned back cuffs, but as the lady conceals the bottom of his outer garment, I cannot be sure. Staring at us with something between amusement and disdain is a man in a cap and striped neckcloth. He too wears his hair loose and cut above the shoulders. 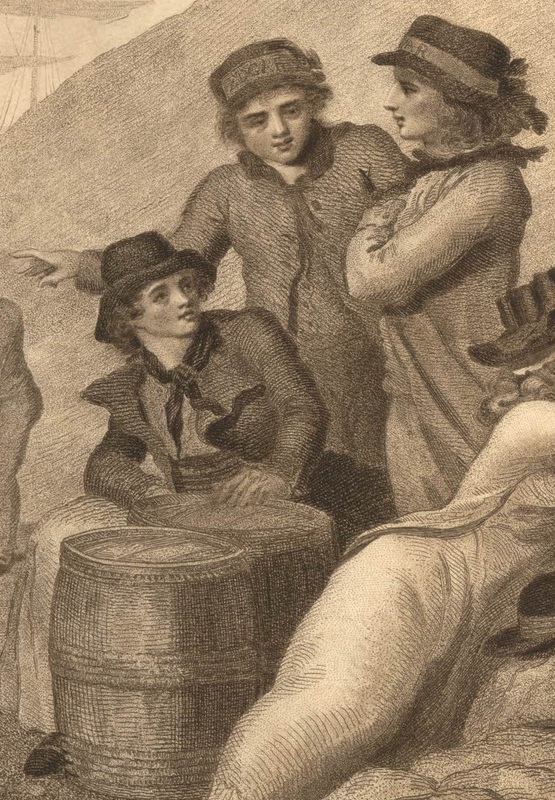 Reclining with a lady, his mate holds his round hat with its rounded crown in one hand, presumably wrapping the other around her. He is without a waistcoat, and wears a jacket with the lapels somewhat turned back at the top. His mariner's cuffs are open. Plain trousers complete his slop clothes. My understanding has always been that Captain's barge crews, when employed in that capacity, where more likely to wear the name of their ship on their hats. There is a boat alongside them, and my assumption would be that it is the Captain's barge, and those are his barge men. But, like you, I had assumed mid-1790s for this practice. Perhaps the Edgars were trendsetters! My thoughts precisely! I had just written such a hypothesis in reply to a question on the British Tars Facebook page. 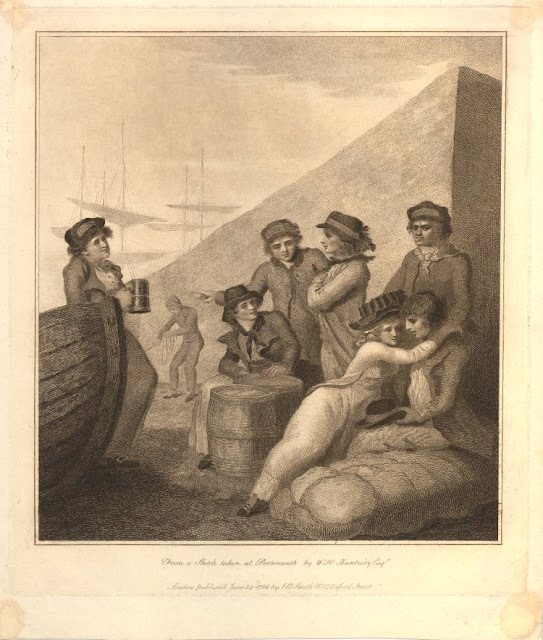 This would also explain why they are lounging around a boat rather than off at some tavern.